Summer is just around the corner! Does that mean choruses of “I’m bored” will start to ring out? There are so many family-friendly options to keep babies and kids entertained during the summer (and throughout the year), but sometimes the tweens and teens can be harder to please. Stave off the restlessness and boredom with our list of places to take your tween or teen in Northern Kentucky and Cincinnati. Of course, this list is by no means exhaustive, so let us know your favorite places for the older ones down in the comments! First up, sporting events. 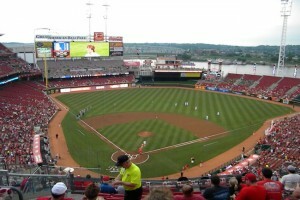 How about taking the family to a Cincinnati Reds game? Great American Ball Park is definitely a Cincinnati gem, and they constantly have giveaways and promotions; two favorites in my house are bobblehead night and the Friday night fireworks! Check the Reds’ website for a complete listing of promotions. If you’ve really got a sports buff in the house, consider taking them to the Cincinnati Reds Hall of Fame and Museum. What better place to learn about the history of baseball than in the city where the first professional baseball team was formed? You don’t have to attend a game in order to visit the museum, although it would make for a great pairing! If you don’t want to deal with the Reds crowds or are looking for a cheaper alternative, check out the Florence Freedom. You will still get to enjoy quality baseball, and there is no shortage of intriguing promotions either! Check their website for a complete listing. Another great sports outing is to see the Cincinnati Cyclones. 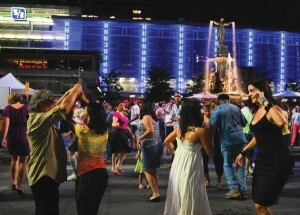 Games are played in Downtown Cincinnati in the US Bank Arena, so it’s not hard to find at all. The action is fast-paced, and you might even be able to catch a fight or two on the rink (nothing too violent, though), which is sure to please your tweens or teens! If you’re not familiar with the rules of hockey, be sure to check out their handy “Hockey 101” guide on their website. Of course, the season won’t start up again until October, but that means you can still enjoy some relatively inexpensive sporting events once the Reds’ season is over! Free entertainment can be hard to come by, so thank goodness our local public libraries are here to help! Below is a list of the library systems in the region that have teen-specific programs throughout the year. They have almost any program you could think of to keep teens engaged, and they are certainly not all focused on just reading! Another laid-back option is drive-in movie theaters. With this past form of entertainment diminishing in the United States, there’s a good chance your tweens or teens have never been to a true drive-in movie. Fortunately, we’re living in an area that has not one, but two drive-in theaters! Both the Holiday Auto Theatre in Hamilton and the Starlite Drive-in in Amelia offer about two films at a time that are currently playing in theatres. What a great family outing or a way for the older kids to spend time with friends! If your teens are into throwback activities, or you’re hoping to introduce them to something that doesn’t require much stress on your body (unlike visiting an amusement park), try the arcade! Both Arcade Legacy and The Place Retro Arcade offer classic arcade games and newer game consoles. Prices are affordable, with either hourly rates or daily rates that also differ depending on age. 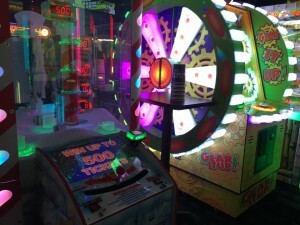 For more contemporary gaming, Dave & Buster’s is the way to go! 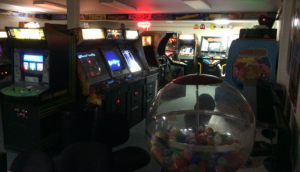 Enjoy a variety of arcade and video games, and maybe grab a bite to eat while you’re there as well. Don’t forget, they just opened a brand new Dave & Buster’s location in Florence, KY too! Want to learn more about our great city’s history? Consider a tour offered through American Legacy Tours. Some options include (but are not limited to) the Queen City Underground tour, the Newport Gangster tour, and the Queen City is Haunted tour. 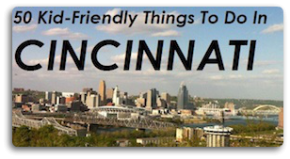 Sounds like a great way to get to know more about Cincinnati and Northern Kentucky, whether you’ve lived here your whole life or recently moved to the area! Tweens and teens are sure to be engaged as well. If your tweens or teens are more the thrill-seeking type, the most obvious choice is probably Kings Island. Kings Island is consistently one of the most-visited amusement parks in the United States, and with both an amusement and a waterpark, there’s enough to keep everyone entertained! Just up the road from Kings Island is the Beach Waterpark. This is a great option if your kids are particularly into water rides. With the closest coastal beaches most of a day’s drive away, you can experience the beach without having to organize a road trip! Once the amusement parks close for the winter, consider hitting up Perfect North Slopes. They have free lessons for beginning skiers and trails to please all skill levels! Snowboarding is also an option if that’s what your older kids are into, as well as tubing to capture the thrill without the necessary skill. Outdoor buffs (or those willing to take on some outdoor adventures) will love Ozone Zipline Adventures. Offered through YMCA Camp Kern, this is a family-friendly zip line canopy tour with multiple tour options, including a river crossing and the opportunity to try zip lining at night! If you have an active tween or teen looking to burn some steam, consider indoor rock climbing at RockQuest Climbing Center or Climb Time of Blue Ash. Both facilities require no prior experience and rent out necessary equipment. Sky Zone Indoor Trampoline Park will certainly get your kids moving. Feel like you’re flying with a SkySlam court, SkyRobics fitness classes, and Ultimate Dodgeball. Burn calories and stay healthy while having fun! Take go karting to a whole new level with Full Throttle Indoor Karting. The professionally designed racetrack has 14 exciting and challenging turns, and each 8-minute race session pits you against the clock as you compete for the fastest lap. Be sure to check their website for reservation policies. Rounding out the list are two venues with multiple entertainment options under one roof. 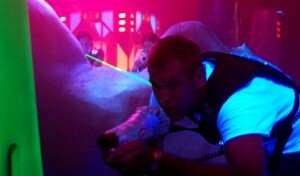 Lazer Kraze offers a multi-level laser tag arena, an arcade, and an indoor trampoline park where participants can work up a sweat playing Air Dodgeball. The Web Extreme Entertainment in West Chester also offers laser tag and an arcade, plus go karts, mini golf, and mini bowling. Both are sure to provide hours of fun!